The U.S. Consumer Product Safety Commission issued a recall on Thursday for a baby rattle due to a possible choking hazard. 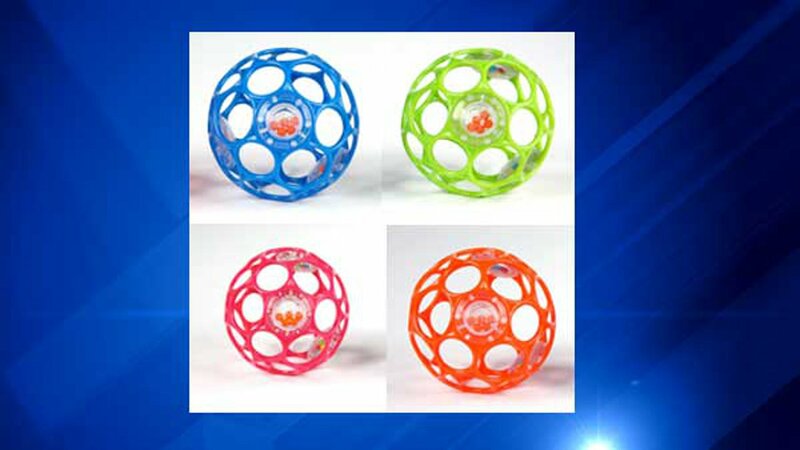 The ball-shaped Kids II Oball Rattle has been recalled because the clear plastic disc on the outside of the ball can break. The small beads inside of the disc pose a choking hazard to young children. About 680,000 rattles in the U.S. and 17,000 in Canada are affected by the recall. The Oball Rattles, model number 81031, in pink, blue, green and orange are affected. The model number was printed on the inner surface of one of the discs and on the packaging. Rattles involved in the recall have the following date codes: T0486, T1456, T2316, T2856 and T3065. The company said the date code is on printed on a small triangle on the side of the rattle. Kids II has received 42 reports of the plastic disc breaking. The Oball Rattles were sold at Target, Walgreens, Walmart, Amazon.com, Babyhaven.com, Diapers.com, ToysRUs.com and other retailers between January 2016 and February 2017. People who purchased the rattles should contact Kids II at 877-243-7314 or go to www.kidsii.com for more information.